The Basin, from the south west. The first reference to the Basin is by Gibson in 1691, when it consisted of “two large fish-ponds…in the middle of each pond is an island…and in the middle of each a house…They are said to be well stocked with fish and so they had need to be if they cost him [Sir Josiah Child] five thousand pounds”. Gibson clearly implies that they were of recent creation and thus part of Sir Josiah Child’s improvements to the gardens and out-park. Located on what had been a gentle slope, the new ponds were contained by a massive embankment to the south, the construction of which presumably accounted for a large proportion of the cost. The embankment retaining The Basin on the south side. The pair of ponds is clearly depicted on Kip’s c.1715 view to the west, which shows them as separated by the main driveway to Wanstead House from the direction of Leytonstone. The Basin assumed more or less its present form in the early eighteenth century in the time of Sir Richard Child, later Viscount Castlemaine and Earl Tylney of Castlemaine. This involved its transformation into a single large expanse of water, in the form of a slightly irregular octagon, with the driveway diverted around its edges. This work had clearly been completed by 1722, when Macky describes it as “a Bason of Water of near half a Mile in Circumference, on which my Lord keeps a Gondola for his Pleasure”. The new Basin is also clearly depicted on Rocque’s 1735 Map. 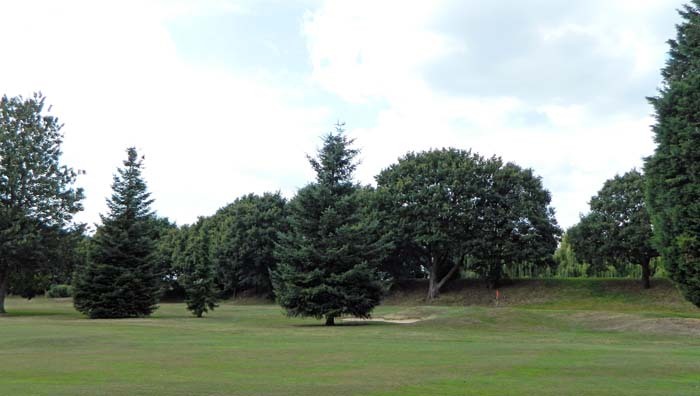 Members of Wanstead Golf Club state that the foundation of the former driveway between the two original fishponds is only 4ft beneath the surface of the current Basin, such that, on a dry year, it is possible to walk across it. The driveway and the bases of the two islands are occasionally visible on aerial photographs. Richard Arnopp, of the Friends of Wanstead Parklands, has commented on the similarity of the general relationship between the palace, basin and avenues in Kensington Gardens to the layout of the western part of the gardens at Wanstead, and he speculates that this may not be accidental. Kensington Gardens owe their present form mainly to George II’s consort Queen Caroline of Brandenburg-Ansbach, who commissioned a comprehensive re-design from Charles Bridgeman and Henry Wise in the 1720s. Some elements of the less elaborately formal post-1715 garden design at Wanstead, with its focus on a vast new lake system surrounding the house on three sides, also appear to bear the hallmarks of Charles Bridgeman, even if documentary evidence of his involvement is lacking. There is, however, a proven link between Wanstead and Kensington Palace in the person of William Kent, who was responsible for decorating the state rooms of both buildings. Kent was a more significant garden designer than he was a painter, and may have had some influence on the gardens at both Wanstead and Kensington. Be that as it may, Bridgeman and Kent - whatever their respective roles in its design may have been - would have been aware of The Basin at Wanstead, and it is quite possible that The Basin at Kensington was consciously modelled on it. As well as the two lakes being known by the same name, they are even of comparable dimensions (though that at Wanstead is somewhat bigger). Dr Sally Jeffery of Birkbeck College regards the suggestion of a link between the two water bodies as plausible. The Basin has undergone some minor alterations in recent decades with the construction of teeing-off platforms in some of the corners. A small island in approximately its centre is also a twentieth century addition.